Its my longest friends ever birthday!. So i decided to rush out from the office and went straight to Publika to celebrate his birthday at the red beanbag. I wanted to go to slappy cakes but i changed my mind because i always wanted to try this estaurant. I went there around 7.00 P.M just nice for dinner. They did christmas decoration which is awesome. Western looking restaurant with some nice food. What else can you ask for? I ordered what is recommended by the waiter. The first thing that interest me is the ice cream cookies! sounds delicious. And yeah i ordered that for RM13 then i ordered the aglio olio RM22 (i'm not up to something heavy that time). As for my friend, he ordered just a chicken burger RM26 (boring ~) They have suggested meal of the day which is rib eye steak if i'm not mistaken. I loveee the environment here. Its not too hot or cold, and the weather was just nice. So once the food arrived, we started to take photos first because the presentation was awesome. The fries for the burger got some seasoning and i liked it. However, the burger was just good as what my friend told me. 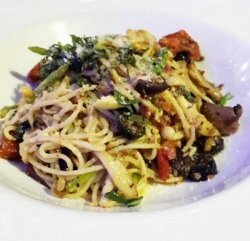 Additionally, my aglio olio was good but too much mushrooms! 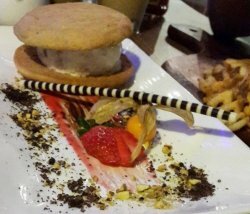 Come to the favourite dish of mine which is the ice cream cookies, i really love the presentation (like you are dining at some hotel, lol ). The taste was sweet but i was able to finished it all tho i shared with my friend (like it was my birthday, haha). So we talk all night long (well not that long as i need to go to work the next day, pfftt holiday mood) . And finally i was able to try this restaurant that people has been talking about. Well for me, it was just good. Maybe i should try their meal of the day. Til next time then.